Had a buffet dinner at Choctaw Casino's Butterfield Buffet last night. Enjoyed a nice selection of food to include Prime Rib! Been here before several times and have yet to be disappointed. Be sure to use your Player's Club Card (or sign up for one) as the meal is heavily discounted for Members. 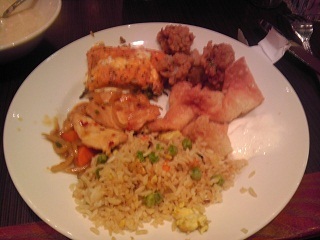 Picture below shows Grilled Salmon, Fried Oysters, Crab Rangoon, Fried Rice, and Sauted Chicken.